Malmaison Oxford Castle in Oxford, England: Originally built by William the Conqueror in 1071, Malmaison Oxford Castle once housed England’s most notorious criminals. Today the castle has been transformed into a luxury hotel with comfortable rooms and suites, but you can still explore the ‘punishment cells’. Many tortured souls that met their end here at Malmaison Oxford Castle have reportedly been seen around the property, including 31-year-old Mary Blandy who was hanged for allegedly poisoning her father in 1752. Rumour has it her ghost can still be seen walking in the area where she would have been hanged, almost 300 years later. A priest was allegedly called upon in the 1970s to perform an exorcism of the building, but failed to curb the wandering spirits. The Congress Plaza in Chicago, USA: Known as Chicago’s most haunted hotel, The Congress Plaza was built over 100 years ago, originally to accommodate The Chicago World’s Fair. It now has 871 guest rooms, and is one of the most popular hotels in the city, despite its spooky inhabitants. Room 441 is apparently haunted by a shadowy female figure lurking by the bed, while a gloved hand has also been spotted sticking out of the hotel wall, supposedly belonging to a worker buried beneath the hotel. The hotel was rumoured to be the home of notorious gangster Al Capone for a while, and some claim he can still be heard by guests wandering the halls. Australian celebrity chef, Pete Evans, made international headlines when he became so overwhelmed by a spooky feeling while staying there that he left in the middle of the night. Fairmont Banff Springs Hotel, Canada: While the Canadian Rockies are synonymous with stunning wilderness, they also hide some ghostly tales at the grand, castle-like Fairmont Banff Springs Hotel in Alberta. Built over 125 years ago by the Canadian Pacific Railway as a luxury stop-off point for train travellers, it has witnessed some tragedies in its time. Among them was a bride who reportedly fell down a staircase and broke her neck after panicking when her dress caught fire. Some say her apparition has been seen on the staircase and dancing in the ballroom. Another was a family that was murdered in room 873, and visions of them have apparently been seen to this day, often in the hallway outside the room. But perhaps the most popular of the reports is that of former bellman, Sam Macauley. He served at the hotel during the 60s and 70s, and it’s said that he can still be seen helping guests up to their rooms in his vintage uniform, often turning on lights and opening locked doors. Karosta Prison Hostel, Latvia: Built around 1900 as an infirmary, Karosta Prison was largely used throughout the 20th century as a Nazi and Soviet military prison, in which hundreds of prisoners were killed. It was here that during World War II, the Nazis sentenced Latvian deserters to death. Most were shot. With so much horror having taken place within these walls, it’s not surprising that there have been many accounts of paranormal activity, so much so that the prison has been turned into a boutique hotel for ghost-chasing travellers. But a night in the clink isn't for the genteel - visitors have to sign a release form acknowledging that they are signing up for the 'full prisoner experience' in Communist-era conditions. This means death threats, warning gunfire, verbal abuse and physical exercise; all for just $16 a night. If that doesn’t get your heart racing, there are several effects that haven’t been orchestrated by staff, including light bulbs that reportedly screw out of their sockets, cell doors opening by themselves and the sound of chains heard echoing down the halls. 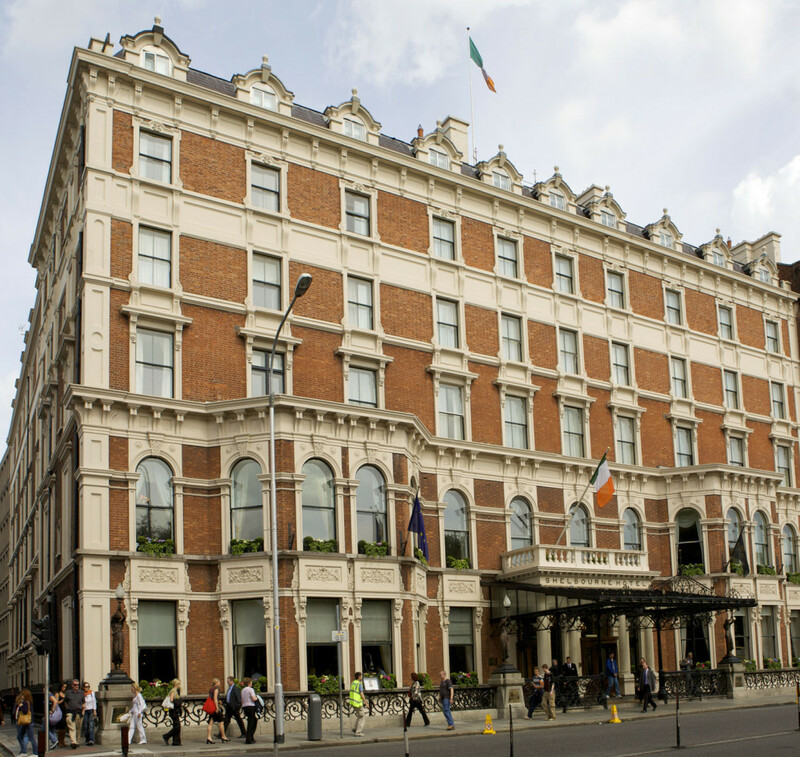 The Shelbourne in Dublin, Ireland: Luxury hotel The Shelbourne, has accumulated plenty of accolades over the years, such as being voted number one hotel in Dublin in Conde Nast’s 2011 Reader’s Choice Awards. It boasts a central location, elegant design, an indulgent spa and oh, that’s right, ghosts. Most notable is the ghost of a little girl named Mary Masters, who’s said to haunt the halls of the property and supposedly cries out for her sister Sophie. Some have concluded that Mary was one of the group of children living in the row of houses that once stood where the hotel is now, and died as a child during a cholera outbreak. Actress Lily Collins (daughter of Phil Collins) reportedly had a run in with her while staying on the fifth floor in 2013. 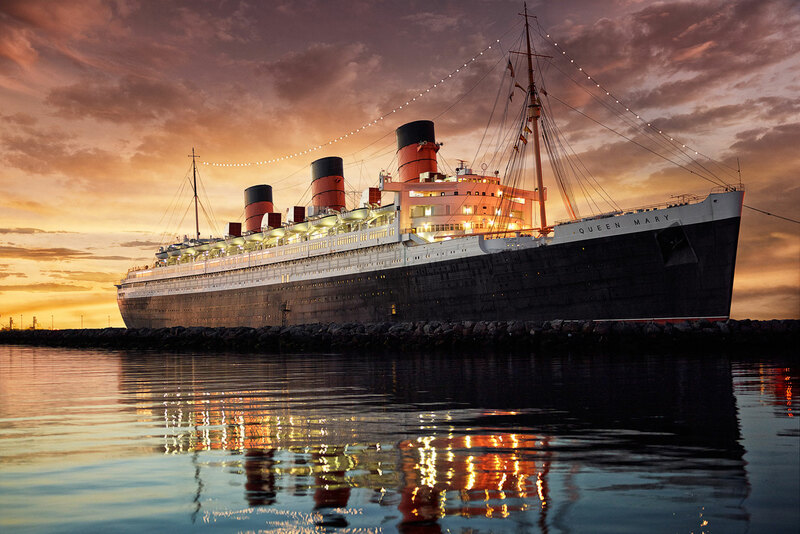 The Queen Mary Hotel in Long Beach, USA: As a 1936 ocean liner, the RMS Queen Mary roamed the high seas until 1967, serving as both a luxury cruise ship for the world’s rich and famous crossing the Atlantic, as well as a troopship during World War II. Nowadays however she serves as one of the most haunted hotels in America, situated at Long Beach, 40 kilometres south of Downtown Los Angeles, California. Just shy of 50 people died aboard the Queen Mary throughout her years of operation, and of these deaths, some souls of the departed have lingered. Among the many reported cases of paranormal activity here has been 'a lady in white', sightings of children who drowned in the ship's pool and a young seaman by the name of John Henry. After lying about his age to board, John was tragically crushed to death in 1966 - it’s said you can still hear knocks and see bright lights around engine room 13 where he met his death. Okay, it’s not everyone’s cup of tea, but with Halloween just around the corner we delve into the spookiest, creepiest, most hair-raising hotels around the globe where travellers are said to have had ghostly experiences. The Queen Mary Hotel in Long Beach, USA. As a 1936 ocean liner, the RMS Queen Mary roamed the high seas until 1967, serving as both a luxury cruise ship for the world’s rich and famous crossing the Atlantic, as well as a troopship during World War II. Nowadays however she serves as one of the most haunted hotels in America, situated at Long Beach, 40 kilometres south of Downtown Los Angeles, California. Just shy of 50 people died aboa.rd the Queen Mary throughout her years of operation, and of these deaths, some souls of the departed have lingered. Among the many reported cases of paranormal activity here has been ‘a lady in white’, sightings of children who drowned in the ship’s pool and a young seaman by the name of John Henry. After lying about his age to board, John was tragically crushed to death in 1966 – it’s said you can still hear knocks and see bright lights around engine room 13 where he met his death. 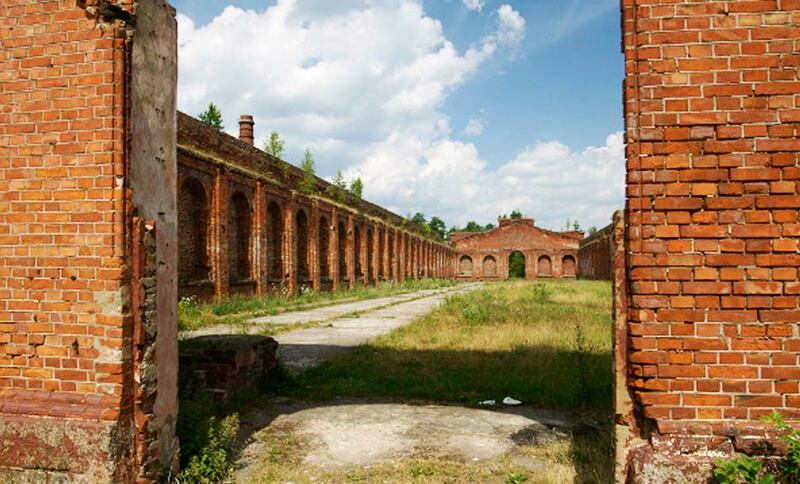 Built around 1900 as an infirmary, Karosta Prison was largely used throughout the 20th century as a Nazi and Soviet military prison, in which hundreds of prisoners were killed. It was here that during World War II, the Nazis sentenced Latvian deserters to death. Most were shot. With so much horror having taken place within these walls, it’s not surprising that there have been many accounts of paranormal activity, so much so that the prison has been turned into a boutique hotel for ghost-chasing travellers. But a night in the clink isn’t for the genteel – visitors have to sign a release form acknowledging that they are signing up for the ‘full prisoner experience’ in Communist-era conditions. This means death threats, warning gunfire, verbal abuse and physical exercise; all for just $16 a night. If that doesn’t get your heart racing, there are several effects that haven’t been orchestrated by staff, including light bulbs that reportedly screw out of their sockets, cell doors opening by themselves and the sound of chains heard echoing down the halls. The Congress Plaza in Chicago, USA. 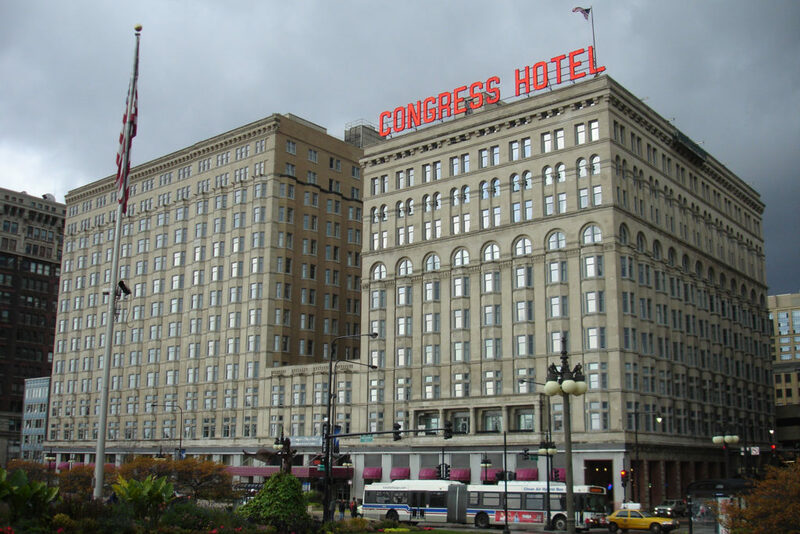 Known as Chicago’s most haunted hotel, The Congress Plaza was built over 100 years ago, originally to accommodate The Chicago World’s Fair. It now has 871 guest rooms, and is one of the most popular hotels in the city, despite its spooky inhabitants. 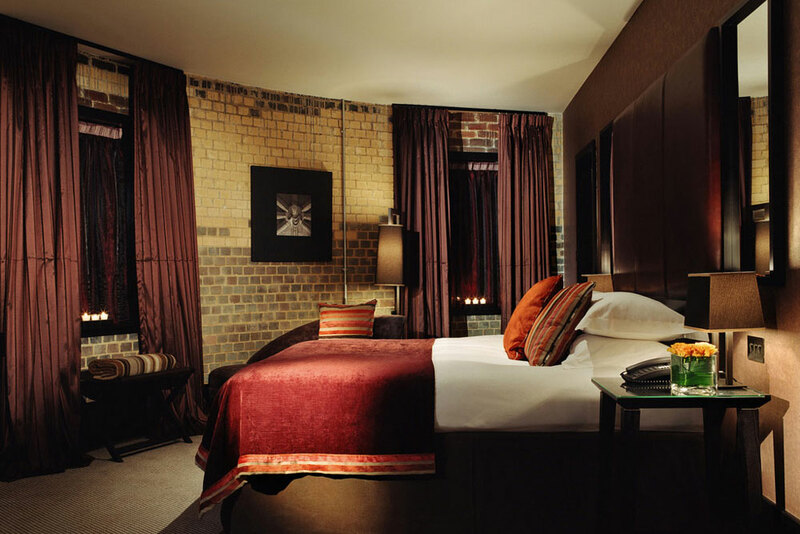 Room 441 is apparently haunted by a shadowy female figure lurking by the bed, while a gloved hand has also been spotted sticking out of the hotel wall, supposedly belonging to a worker buried beneath the hotel. The hotel was rumoured to be the home of notorious gangster Al Capone for a while, and some claim he can still be heard by guests wandering the halls. Australian celebrity chef, Pete Evans, made international headlines when he became so overwhelmed by a spooky feeling while staying there that he left in the middle of the night. Originally built by William the Conqueror in 1071, Malmaison Oxford Castle once housed England’s most notorious criminals. Today the castle has been transformed into a luxury hotel with comfortable rooms and suites, but you can still explore the ‘punishment cells’. Many tortured souls that met their end here at Malmaison Oxford Castle have reportedly been seen around the property, including 31-year-old Mary Blandy who was hanged for allegedly poisoning her father in 1752. Rumour has it her ghost can still be seen walking in the area where she would have been hanged, almost 300 years later. A priest was allegedly called upon in the 1970s to perform an exorcism of the building, but failed to curb the wandering spirits. 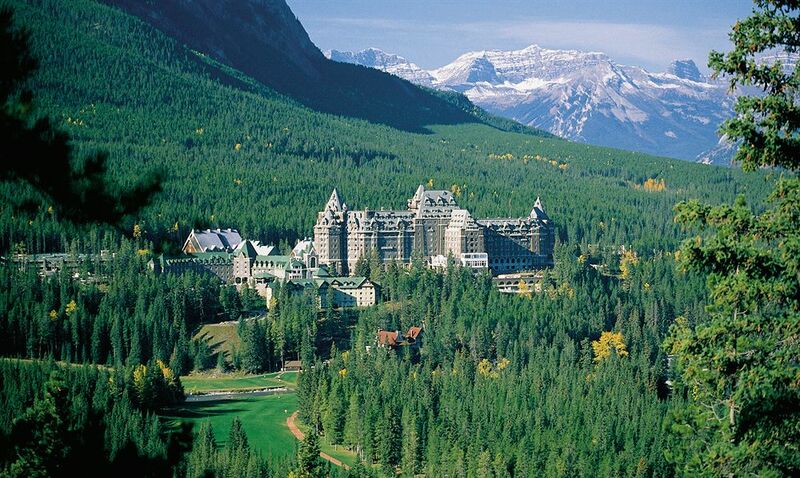 Fairmont Banff Springs Hotel, Canada. While the Canadian Rockies are synonymous with stunning wilderness, they also hide some ghostly tales at the grand, castle-like Fairmont Banff Springs Hotel in Alberta. Built over 125 years ago by the Canadian Pacific Railway as a luxury stop-off point for train travellers, it has witnessed some tragedies in its time. Among them was a bride who reportedly fell down a staircase and broke her neck after panicking when her dress caught fire. Some say her apparition has been seen on the staircase and dancing in the ballroom. Another was a family that was murdered in room 873, and visions of them have apparently been seen to this day, often in the hallway outside the room. But perhaps the most popular of the reports is that of former bellman, Sam Macauley. He served at the hotel during the 60s and 70s, and it’s said that he can still be seen helping guests up to their rooms in his vintage uniform, often turning on lights and opening locked doors. While this 600-room hotel in central Bangkok is popular among travellers, its generous rooms are not all that it’s known for. One man claimed to have heard crying noises in the bathroom, which he assumed to be his wife. However, she wasn’t even there – when he went to check on her, the room was empty. Over the years other guests have reported seeing ghostly figures sitting on the sofas, staring at them but vanishing shortly after. The Shelbourne in Dublin, Ireland. Luxury hotel The Shelbourne, has accumulated plenty of accolades over the years, such as being voted number one hotel in Dublin in Conde Nast’s 2011 Reader’s Choice Awards. It boasts a central location, elegant design, an indulgent spa and oh, that’s right, ghosts. Most notable is the ghost of a little girl named Mary Masters, who’s said to haunt the halls of the property and supposedly cries out for her sister Sophie. Some have concluded that Mary was one of the group of children living in the row of houses that once stood where the hotel is now, and died as a child during a cholera outbreak. Actress Lily Collins (daughter of Phil Collins) reportedly had a run in with her while staying on the fifth floor in 2013. For more information on these properties visit KAYAK.com.au.